Jango Fett: legendary Mandalorian warrior, infamous bounty hunter, loving dad?? Although, technically his son (Boba Fett, whose name may ring a bell) was his clone, Jango raised him like a son. He taught him all of his tricks so that one day Boba would be as great a bounty hunter as he was. Who better to carry on his legacy than... himself? 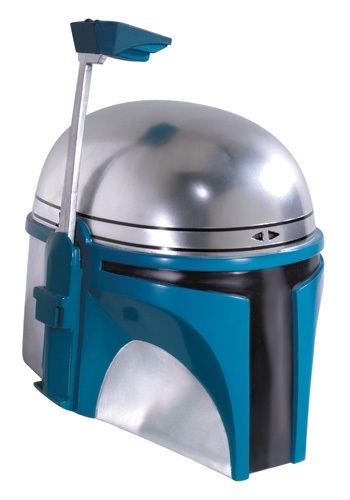 Jango's armor is as memorable as the sly mercenary who wore it, so if you're dressing up like the elder Fett, we recommend this Jango Fett Collectible Helmet to look the most like him! It's collectible quality molded vinyl, so it's more durable and detailed than a less expensive costume helmet. While it may not be as tough as actual Mandalorian headgear, it looks just as intimidating. And when you're not dressed in your costume, you can wear it with your regular work outfit to keep your coworkers on their toes, just like how Papa Fett would have trained little Boba!